Autumn looks to have finally struck with temperatures starting to drop. The new boiler appears to be doing sterling service in these first days and nights of needing the heating and we've all had colds. This is M's first cold and I think she's coped remarkably well - at least through the day. Nights have been a bit fraught as tiredness and feeling grotty have gotten a hold, but otherwise M has been quite chirpy about the whole thing. I've also had a birthday which passed fairly quietly this year - not that my birthdays are ever really raucous affairs! We did manage to get together with friends for lunch last Saturday which was good. I also received a good haul of crochet books for which I am grateful. So far I've only really had time to glance through them but they're all focused on small projects which can be squeezed in as and to when around M.
All of which means I really do need to get on and make some stuff. 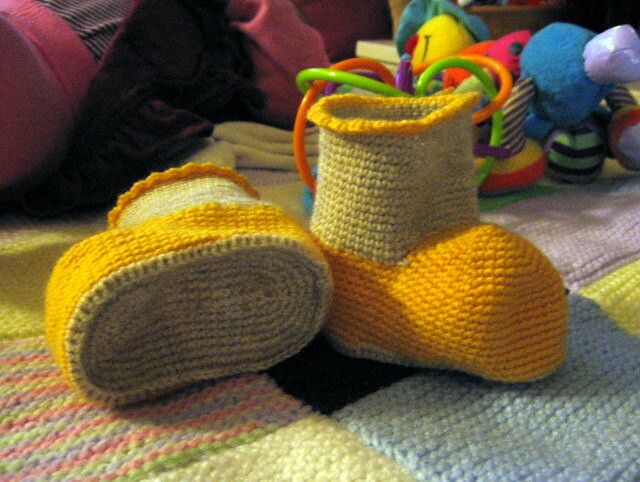 Following on from the success of the Flaming Hot Booties I decided to make another pair! This time I did a little stash diving, rummaging in my sock yarn hoard and pulling out two solid balls. One of the joys of sock knitting is watching a self striping or patterned yarn do its thing, as a result I don't own many solid colours. In fact I only had three colours to choose from - pink, yellow or grey. 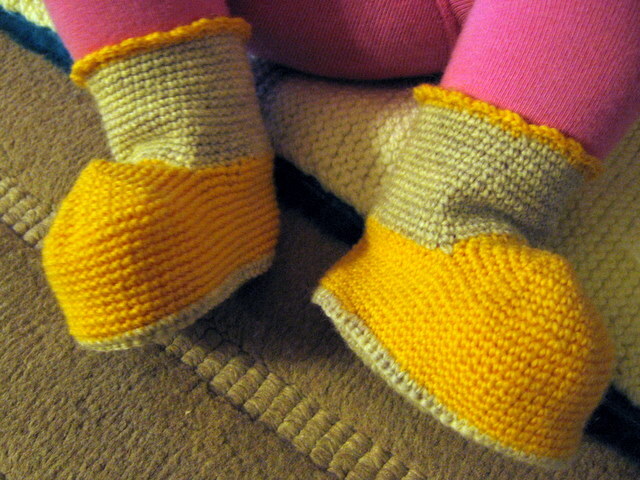 The pink had a bit of silk mixed in, so wasn't ideal for booties so I put it aside, leaving me with the yellow and grey. Hopefully the result looks bright and cheery. The sock yarn in both cases is a standard Regia 4 ply; 75 percent wool, 25 nylon making it both warm and durable. 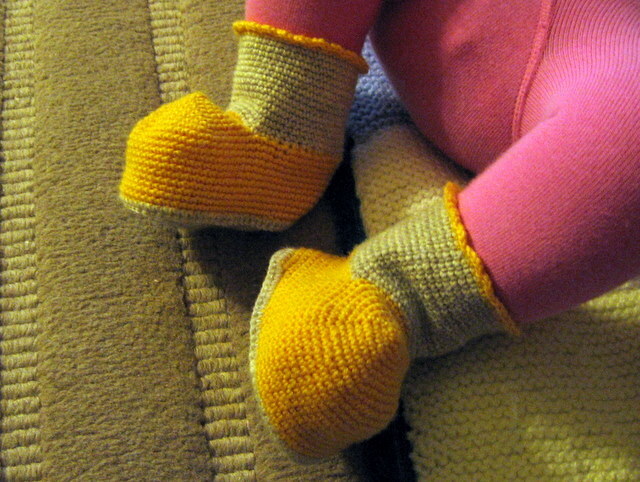 The same 3mm hook was used and because the booties followed on quickly from the previous pair they were easy to work. Once more the pattern is Little Feet by Joan Nossa (Ravelry Link) but learning from experience I reworked the stitch count to make joining the sole easier. I also rang the changes a little adding a scalloped edge to the cuff rather than picot. 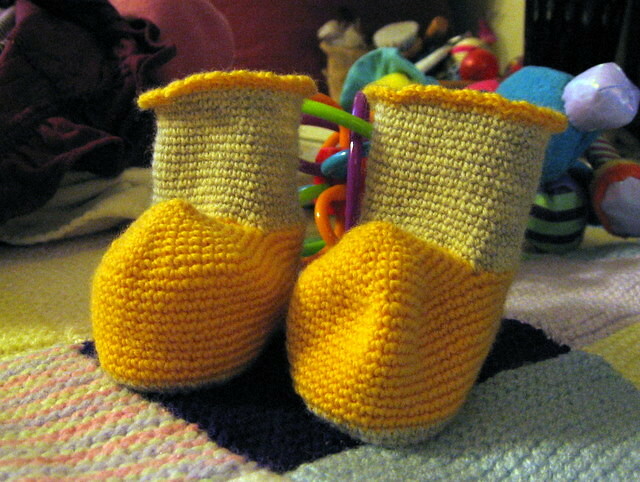 The resulting booties fit a foot up to 11cm long which should fit between 3 and 6 months I hope. Changes I made to the pattern are as follows. I started the top of the foot with a sliding loop rather than a chain, just because that’s my preference. 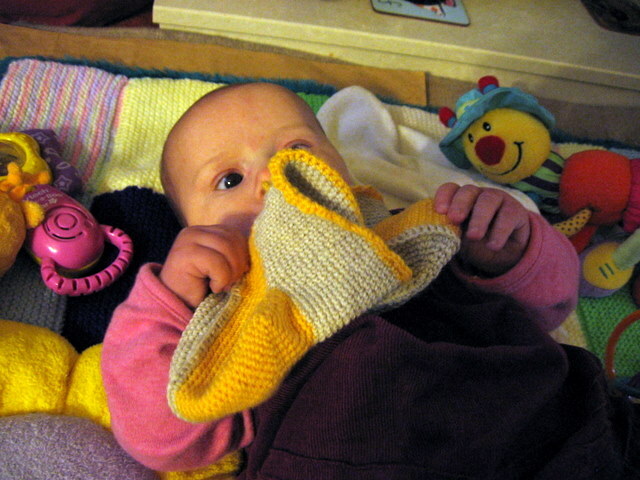 Again, a good little project easily worked around a baby and made up fairly quickly. Using solid colours makes them appear more chunky somehow, despite this pair being only marginally larger than the first. M likes them and has indicated they are very nom-able!